The film received seven Oscar nominations in 1944. 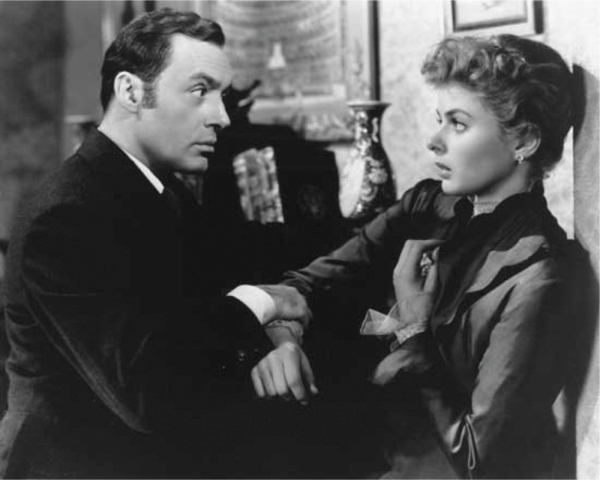 In the 1944 movie, “Gaslight”, Charles Boyer systematically sets about altering his wife, Ingrid Bergman's, perception of reality, slowly driving her mad, simply because he wanted to have her committed so he could steal from her. He does this by causing the gaslights in their turn of the last century London townhouse to flicker on and off at odd moments, dressing up like Bergman's deceased aunt and marching to and fro in the attic when she is supposedly alone in the house, misplacing objects and accusing her of moving them. When she questions her own mind or him, he simply tells her that she is imagining things. He does this repeatedly and soon enough she begins to believe she is mad. She no longer gives credence to her own instincts or perceptions and becomes wholly reliant on her abuser's perception of reality and the world. Boyer becomes the arbiter of what she sees, feels, even tastes or smells. She is then rendered a hostage of someone else's perception of her and reality itself. Sound familiar, ladies? How often have we been told we are “overreacting” or getting “hysterical”—that word irks me to no end—over nothing? I have often been told to calm down and stop being so emotional when I am trying fervently to articulate some hurt or instinct. Huh? Well, men are notorious (another great Ingrid Bergman movie) for 'gaslighting' women. It is the male modus operandi for maintaining the upper hand in the tango of the sexes. I do not want to use the word battle, as I am loath to describe human relationships in war like terms. There is a spectrum, of course, of the extent to which one is gas lit and how damaging it is. It ranges from men trying to avoid confrontations about other women; like say when one sees a picture of a panting, peri- menopausal trollop pressing herself up against their boyfriend's knee, and asks him about it and he says, “don't be silly, she's just friendly.” Yeah right. Where was I? Oh yes, someone was being “silly”, “imagining” things, being dismissed. In this example (fictional, of course), however, it is not too serious. The person is mostly likely not imagining the trollop's over-familiarity but it's not really an issue. The issue is the person should not have her feelings dismissed. This is Gas –“lite”, not too heavy. Then there is the most pernicious kind that is essentially a form of abuse that can have long- term psychological consequences. I have been reading more and more about the vicious attacks on women in Bangladesh at the hands of their partners, and it occurred to me that with many of them, the physical violence might have not been the initial way the abuse began. The emotional and psychological abuse might be the first signs of what is to come. If women, young and old know how to spot it early on and arrest it, then it actually might mean the difference between life and death. 4. You're always apologising to your mother, father, boyfriend and boss. 5. You can't understand why, with so many apparently good things in your life, you aren't happier. 6. You frequently make excuses for your partner's behaviour to friends and family. 7. You find yourself withholding information from friends and family so you don't have to explain or make excuses. 11. You have the sense that you used to be a very different person - more confident, more fun loving, more relaxed. 14. You wonder if you are a "good enough" girlfriend/ wife/employee/ friend; daughter. 15. You find yourself withholding information from friends and family so you don't have to explain or make excuses. If any of these things apply, then one must ask her the hard questions. If most or all of these apply, it is time to leave. Know that you are not mad. The very thing that distinguishes us is our divine feminine “knowing”. It is the power that would make me rise from my bed precisely five seconds before my kid would let out a cry that he was hungry. “On it, kid,” I have said more than once. It is the power that causes more than one of my girlfriends to call me and say, “What's wrong?” while they are sitting in Sao Paulo, or Dhaka or Brooklyn and I have not spoken to them in months. “How did you know?” I would say. Of course she does. It is that KNOW that might save one's life. Now, women also gaslight other women. It is a very powerful weapon. When I was in college I had a friend who was constantly putting me down, subtly, and it was erosive. It wore away at my self- confidence and actually still affects me today. Until then it had not occurred to me that I was not pretty. I mean I did not think I had a face that would launch ships or sink them for that matter. I managed just fine with this kisser in the male attention department, but somehow after she kept insinuating that I was not that pretty, I started to believe her, so much so that even now when someone says, “You look lovely,” I'm like, yeah right! Are you blind? It didn't help matters that she was actually beautiful in my eyes and still is. But she is no longer my friend. Thank God. It took me the better part of a decade to be rid of this gas lighter, and it was not violent and we did not have children together, so I cannot begin to fathom how hard it is for someone who is married to one. Yet, it is a new year, and we have only one turn around this earthly plane, and women owe it to themselves to be happy and allow a different kind of light to illuminate their spirits.